Well hello. I like that introduction I might keep it. It suits my husky voice this week. Well I'm telling myself that anyway. Please bear with me. Show 16 seems to be the croaky show, but I'll soldier on because that's how I roll. This show is simply good music. Two tracks from two different bands or artists that you may just fall for in a big way. Let's see what we've got for you. From Canterbury, U.K. We have a five piece called CoCo & The Butterfields. They came together through the “busking scene”. How wonderful is that? Canterbury has a busking scene and these guys kept bumping into each other and have formed this wonderful collection re-inventing and re-enforcing each others talents to come up with a great band and a whole new genre. What would you get if you fuse hip-hop with folk? Fip Fok of course. It's superb and such a great concept they named their first EP after it. I discovered them when I stumbled on a brilliantly creative video made with stop-frame animation to their excellent track “Astronaut”. The whole band is a creative melting pot. Their latest single “Warriors” has a video that has created a whole world including maps, glorious costumes and tribes of peoples. It's genius and I'll post a link to those videos on the JosieJo Show facebook page. Go there and you'll also find a video I filmed at a recent gig of theirs of one of my favourite tracks of theirs “Tipperary Boy” it's a bit wobbly because I was dancing so much, but I hope that it captures just how infectious they are live. It was a blinding night and seeing them live is highly recommended. They start a little big tour of the Uk on the 24th of April in Swindon taking in cities including London, Bristol,York and Sheffield amongst many others. Follow me on twitter @JosieJoShow and I'll try and keep you up to date with where they're off to next. Oh yeah! And that, my friends is what you get when you collaborate hip-hop and folk. It's Fip Fok. It occurs to me that I don't actually know what a Butterfield is, but since my word processing programme never throws it up as a spelling mistake then it must be a word. I imagine it involves something like rural fields of buttercups skipping and long skirts. They have a new six track EP out called “King of the Corner” It's incredibly reasonably priced. Go to www.cocoandthebutterfields.com for all that and more. Aww. From Russia with peace and love from Sundoze. Extraordinary. They'd love to hear what you think of their sound so get in touch with them on bandcamp or via their Facebook page. Links to all the bands I've played on the JosieJo Show are right there on my website www.josiejoshow.com My Facebook page has extra content including photos and videos of CoCo & the Butterfields and a link to that Round At Milligan's show I was talking about. Thank you for listening and finally if you grew up in the UK in the 1980's and watched darts themed quiz shows you'll know what I mean when I say listen to Tony. Well hello. This is The JosieJo Show presenting you with two great tracks from two different artists for your aural delight and this week I may very well have a sneaky little bonus track for you at the end because you've been so good. Let's see what happens. Caddy is the solo project of Tomas Dahl form Norway. I found him because he's been played by several American radio stations. These radio plays have all been by people that are passionate about independent music and we've been passing Tomas between us for a while now mostly because he has a great new single out called “Beautiful Strange”. Tomas brought an album out called “Electric Hero” back in 2010, although he has been touring and working as a session musician with many different bands for the past 15 years. He tells me that he's been in bands like Turbonegro and the Yums Yums and while this doesn't mean much to me I'm going to check them out after the show. I really like doing this show for several reasons and finding Caddy has recently highlighted some of those things for me. I love the journeys through music it takes me on, like following up this show by going to listen to Tomas's previous bands. I also love the community that I have found which has nurtured me since finding, firstly Scrub Radio, and then others. There are the others out there playing great music. Among those that have played Tomas for instance are Sparky Shockpop on Scrub Radio, the mighty Dennis “Songsmith” Holseybrook on Hamilton radio, Steve Jarrott on Qstar and Deb Millstein's Crystal Cavern Show on Hamilton Radio, Friday's 8pm Uk time 3pm EST. Tomas was in a recent edition of Deb's The Crystal Cavern where artists choose an original favourite track of their own to be played alongside a track that they think has influenced that music. It's an original and interesting way of presenting new music and Deb would love it if you could tune in sometime. Treat yourself and make it soon. That was Caddy and “Beautiful Strange” a project from Norwegian born Tomas Dahl. Xander & The Keys are the next band to have taken my fancy. From Bournemouth in the UK Xander and the Keys formed after Luke Adams, their manager heard Xander play and decided to team him up with The Keys. Xander is the fun, bouncy front man who provides the vocals and guitar ably backed up by Lee Hammond, on bass, and Marko Owen, also known as “The Beast” on drums. Let's face it, it you're going to have a drummer with a nickname you probably can't get much better than “The Beast”. They've had a busy year, getting signed to Dorset based Red Dragon Records which is where I found them and September 2012 saw the launch of their debut EP “The First Marker”. They play live at the Thomas Tripp in Christchurch, England on January 18th 2014, the 24th at The Forester's Arms, in Andover Uk, followed up by a smattering of gigs within the South of England including at Blandford Forum and Wimborne. Incidentally, last time I looked Wimborne had a rather excellent Town Crier called Chris Brown, also known as Dapper Dan who has an incredibly encyclopaedic knowledge of music spanning back years and a passion for reggae like no one I have ever met (and I've met some reggae monomaniacs in my time). As a special meaty treat I'm going to play you out with the track I found in 2013 that stood out, for me, as a true anthem of my soul. Don't forget to follow me on Mixcloud so you'll always know when the next show is available, on Twitter @JosieJoShow for news events, gigs and releases, on the JosieJo Show facebook page for extra content and on Blogger and Tumblr for the show in text form including links to the tracks. Tell your friends and send them to www.josiejoshow.com so they can see and hear what you've been raving about. Now to play us out with their super, life-affirming track “Dr. Feelgood” is Ring Ring Rouge..oh and thank you for listening. Hello there. This is The JosieJo Show where I bring you two tracks from two different bands or artists that I just really like. This is show number 14. The very first of 2014. Oh the synergy of show 14 being the first of 2014. Just like 2014 this is going to be better than the sum its parts and those parts are two bands from America, one from Boston and one from Concord, New Hampshire. Are you excited? You should be. The JosieJo Show is all about great original music and there is a bar in Cambridge, Massachusetts called TOAD and it is beloved by my first band Tad Overbaugh and The Late Arrivals. I'll tell you about Tad in a minute, but first let me wax lyrical about TOAD. I've never been there, but it is now on my list of places I have to go to. TOAD is a live music venue that has a board outside that states, in no uncertain terms “Never a cover” and I'm all for that. Plus, apparently it has great food and does a decent pint of IPA. Now that is my kinda place and Tad Overbaugh and the Late Arrivals play there and they are my kinda band. This band is headed up by Tad himself who provides the tunes, guitar and lead vocals skilfully supported by, Rick Cranford on drums, Bruce Freisinger on lead guitar and BV's (that's backing vocals. Get me and my abbreviations) and Matt Arnold on bass (wasn't he a 19th Century poet?). Tad used to play with his band The Kickbacks, but he is producing his new album with the Late Arrivals right now on Peeled Label Records. It's being worked on in two different states and should be available in the second quarter of this year. For such a happy, bouncy tune I think that has quite a sad end chord. “Lazy Eye” by Tad Overbaugh and The Late Arrivals. I found Tad by following links from the Boston IPO festival November 2013 run by the mighty David Bash. It was such a good line up that I got the next band from there too. The Tripping Souls is the creative talent of Paul Makris. With the help of his mates on drums and bass he writes, sings, tickles the keyboard and plays guitars to produce really super, alternative rock. Oh yes and he's a rather cool dude; a sort of better looking version of Paul Weller. He's had a great nine months including releasing an EP self titled The Tripping Souls. He's played IPO Boston, as I mentioned, and get this...he opened for Deer Tick at the Sneakers and Speakers Festival in July 2013. 2014 looks like it's going to be a prosperous year for The Tripping Souls as he starts a run of gigs on the 11th January 2014. Catch him, if you can, opening for Big Bad Voodoo Daddy at the Capitol Centre for arts Concord, New Hampshire. My favourite The Tripping Souls track is of course the one I'm going to play you, but if you go to my JosieJo show facebook page I'll post a link to his reverbnation site where you can hear several of his tunes and really get a feel of his American take on the Brit-pop sound. I struggled to choose a track from The Tripping Souls because I genuinely think they are all strong, but I chose this one because it reminds me of that great Robert Frost poem “The Road Not Taken”. “The Narrow Road” by The Tripping Souls, has that self-aware assurance, whilst at the same time portraying that feeling that you just can't be everywhere you need to be all at the same time. Its musicality is superb. The tune and lyrics are all part of its poetry. I love the beginning, middle and end of this track. This is the journey that is The Tripping Souls and “Narrow Road”. Awesome. Thanks to Boston IPO for providing two great bands for me to play. Keep listening to the JosieJo Show in 2014 for more tunes. I really appreciate all your support and remember that the bands and artists do too so if you like what you hear on The JosieJo Show please seek out them out and tell them you care. Oh and tell them I sent ya. Follow me on twitter @josiejoshow for news, events, gigs and releases and my facebook page for extra content including free music and great projects. Let's keep the good stuff coming. Thank you for listening. This is the JosieJo Show and each show contains two great tracks from two different artists, bands or other musical brilliantness type people for your aural delight. You deserve a bit of you time and I think you deserve a bit more right now so gather your nearest and dearest round the laptop, PC, tablet or other mobile device for a new seasonal tradition...listening to The JosieJo Show. Heck you can even listen on your own and guess what? I'm giving you four great tracks in this show. We'll start with a tribute to the late, great Nelson Mandela and then launch into three Christmas tunes that you may not have heard before, but may well become your traditional treats. It's the Christmas JosieJo Show, dontcha know? So let's first give you the super wonderful world music talent of Paula Ryan. Paula was born in the Irish town of Colnmel. I stayed there this year and as far as I could see, as well as being stunningly beautiful, is a town built on the production of cider. As you can imagine it has a great tradition of live music and an incredible disappearing/reappearing mountain as the weather descends and lifts again. Paula has been producing music for many a year now and her style is incredibly diverse. Sometimes her sound is pure irish folk, then the next track will be good old American country, but the track I'm going to play has African roots and an almost worshipful feel, like a hymn sung in church. Awesome man and a wonderful tribute I think. Paula recently performed that track as part of a Mandela tribute and all accounts talk of it being very moving. So do you fancy a Christmas track? Do ya? So here's the thing. 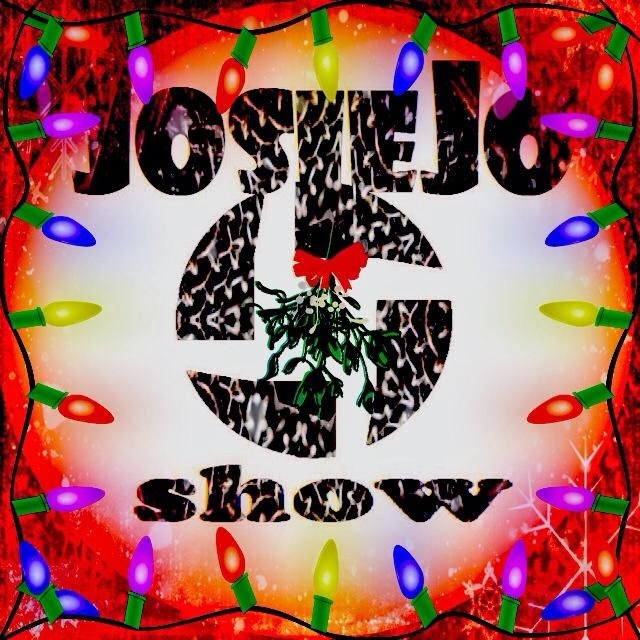 It's Show 13 of the JosieJo Show and the last one that will be posted in 2013 so I need to bring you two tracks. One to take you out of 2013 and one to take you into 2014. Do we go out with a bang and float you into the new year on a soothing ballad, or do I soothe you out of 2013 and bring 2014 in with a big celebratory bang? You know you don't need me to tell you what tracks to listen to depending on your mood. All I aim to do is to introduce bands or artists that you wouldn't necessarily come across and you may even find you new favourite band. The Rotary Prophets. This band is a five piece that have been together for just over a year, but they've been in the music game for much longer. How can you not love a band with a guy who plays piano, organ and lap steel? That's good old Ted Collins. The main songwriter is John Maloney and the other three members are Dave Coughlan, Ray Boyce and Damon Vrettos. They have a deep rooted love of story songs and their five song EP called “Faith-Lost-Love” is jam packed with American tales and the love of the brave. So that was my Show 13, my goodbye to 2013 and hello to 2014. follow me on Mixcloud and you'll get an update when Show 14 is up, that will be the first Show of 2014 and you can't miss that. Follow me on twitter @josiejoshow for news, events, gigs and releases and check out my Facebook page for extra content and links to cool things. See if you can find me in two Tingle Jingle Mingles and enjoy yourselves wherever you are. Happy everything everyone and thank you for listening.